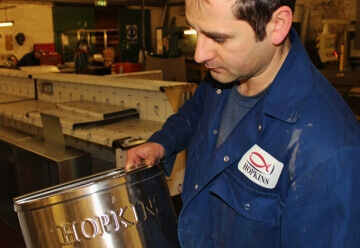 Leeds, UK, 11 December 2013– Catering equipment supplier Hopkins has moved its entire mobile workforce to BigChange’s cutting-edge telematics system after trials showed it could save engineers and admin staff significant time and hassle. The Leeds-based outfit has now completed a full roll-out of software vendor BigChange’s JobWatch system following a dry run involving two of its service crews. Hopkins’ entire fleet of 17 service vehicles have been fitted with a mobile computer which not only provides satellite navigation and vehicle tracking, but communicates with the back office and allows engineers to access up-to-the-minute job schedules and job-specific electronic worksheets. The deployment is already leading to greater operational efficiencies and eliminating paperwork across the organisation. It also comes at a time when Hopkins has added extra service capacity to support the expansion of Harry Ramsden’s, one of its main customers in the fish and chip shop market. Managing director, Chris Hopkins, said back office staff were saving up to two hours a day on admin duties since the software was installed, while engineers could now pick up important messages without having to talk while driving or breaking from their work. The technology is also being used to help the company plot the best route for getting to customers and avoid delays by navigating around traffic hotspots. He said the firm’s customer service had been transformed by the system. The company’s engineers have particular reason to be happy that the system has been introduced in time for the festive holiday system. It means that this year, for the first time, they will be able to base themselves at home when on call over Christmas rather than having to visit the office to schedule emergency jobs.